Opal Kelly's new XEM7001 is a product refresh of their popular XEM3001 and XEM6001 modules with the Xilinx Artix-7 FPGA. Opal Kelly, a leading producer of powerful FPGA modules that provide essential device-to-computer interconnect using USB or PCI Express, announced the XEM7001 USB 2.0 FPGA Module, combining a HighSpeed USB 2.0 interface and a Xilinx Artix-7 FPGA into a compact business-card sized form factor suitable for prototyping, testing, and production-ready integration. The XEM7001 USB interface delivers transfer rates exceeding 36 MB/s and includes a multi-output clock generator PLL. The XEM7001 measures only 3.5” x 2.0” (88.9mm x 50.8mm), includes the FPGA, USB interface, 32 Mb SPI Flash, multi-output clock generating PLL, and is designed to operate as a bus-powered device from the +5V USB power supply. The XEM7001 fully supports Opal Kelly’s popular cross-platform FrontPanel SDK for FPGA configuration and host communication using a simple API in C/C++, C#, Python, Java, and Ruby programming languages. The XEM7001 may also be configured to boot the FPGA in nontethered mode from the on-board SPI Flash. The XEM7001 is continues a form-factor legacy behind the very popular XEM3001 and XEM6001, Xilinx Spartan-3 and Spartan-6 based devices, respectively. With an identical form factor and connector location, the XEM7001 should be a lifecycle-extending replacement for the XEM3001 or XEM6001 in most applications. While HDL application migration will be required, the FrontPanel SDK enables significant re-use of existing application code. The XEM7001 is available now with the Xilinx XC7A15 device density. The XEM7001-A15 is in stock and available now through Opal Kelly’s online web store at $199.95 (qty 1) with volume discounts starting at 100 pieces. Please contact sales(at)opalkelly(dot)com for more information. Opal Kelly, founded in 2004, offers a range of powerful, off-the-shelf, USB 2.0, USB 3.0, and PCI Express FPGA modules, including the easy-to-use Opal Kelly FrontPanel software interface and robust API. 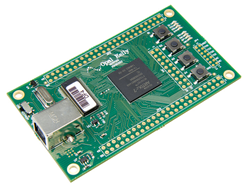 Opal Kelly products provide the essential device-to-computer interconnect for fast and efficient product prototyping, testing, development, and OEM integration. Development engineers, researchers, teachers, and serious hobbyists, worldwide, use Opal Kelly modules for a versatile and economical interconnect solution that shortens development time, fills expertise gaps, and dramatically accelerates time to market. For more information, or to purchase Opal Kelly products, please visit http://www.opalkelly.com.